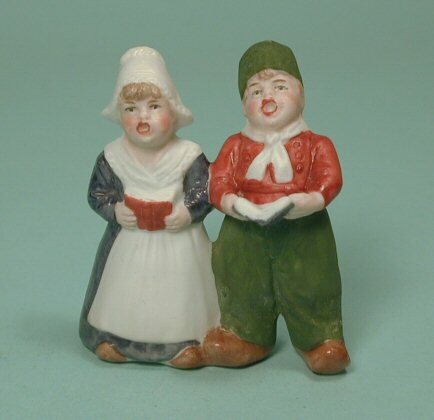 These two little darlings are so expressive and so serious, they just want to make you smile. Made by the firm of Gr. 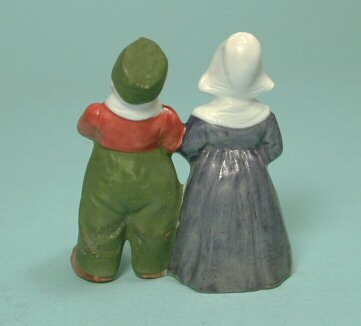 Heubach, the singing Dutch boy and girl are unusual for they have the combination of the blue and white colors with the green and rust colors--I have never seen these color combinations together in one piece. I've looked with a magnifying glass and it looks like there is a faint Heubach marking on his left foot but it is difficult to make out--looks to be round like the Heubach sunburst mark. It is in great condition with no breaks or repairs. 2 1/2" high. Made in Germany c. 1912. Great facial expressions with excellent painting on the faces especially for such a small size.